Pleasant Ridge Lodge No. 282, F.&A.M. has its origin in the natural desire of its sixteen original members, living with a radius of seven miles from out present Lodge Hall, to have a Masonic Home nearer to them than Montgomery Lodge, Montgomery, Ohio. Their residences so far as the records show, included Carthage, Lockland, Madeira, Norwood, and surrounding areas. Their enthusiasm and interest in Masonry must have been great for on April 23, 1856 dispensation was granted for the formation of a new Masonic Lodge. A charter was granted on October 22, 1856 containing the names of the sixteen charter members. This charter was permanently framed on August 5, 1856 and has adorned the wall of Pleasant Ridge Lodge from that time to the present. On November 9,1886, Pleasant Ridge Lodge was officially incorporated under the laws of the State of Ohio. The charter included the names of several well known families of the area including Stephen W. Reeder, a member of Miami Lodge and the first Worshipful Master of our Lodge. Brother Reeder, a leading member of the Lodge, was elected an honorary member on April 3,1860, in recognition of his many services. Other original officers and members included Jesse Flinn of Montgomery Lodge who was the first Senior Warden. He later served the Lodge as Junior Warden from 1859-1861. William S. Laboyteaux from McMaking Lodge was Junior Warden and later Senior Warden but withdrew from the Lodge before serving his term. Hezekiah Bonham served in the capacity of Treasurer for twenty-two years until his death. Isaac C. Ferris, the first Secretary, and John Schenck, the first Senior Deacon, were both members of our Mother Lodge, Montgomery Lodge, No. 94, F.& A.M.
Edward F. Pryor of Springdale Lodge was the first Junior Deacon and later served the Lodge as Secretary for sev eral years. James Thomas, Montgomery Lodge was the first Tyler, and Herman B. Turrill, also of Montgomery Lodge, was Secretary in 1862 and 1863. The first meeting of Pleasant Ridge Lodge was held in a small room in Pleasant Ridge the exact location being unknown. This meeting place was occupied for about six months, when for some unknown reason, they were compelled to leave. Apparently unable to obtain a suitable meeting place in Pleasant Ridge, the Lodge, with permission of the Grand Lodge of Ohio, was moved to Carthage. Many of the members lived in that area which probably would explain the choice of that location. However, meetings were only held there for seven months when the Lodge was returned to Pleasant Ridge. In December 1857, the Lodge secured a meeting place in what was then called Hildreth's Hall, at the corner of Ridge and Montgomery Roads. The Lodge met in the Hall for twenty-nine years during which time agitation was renewed from another move. 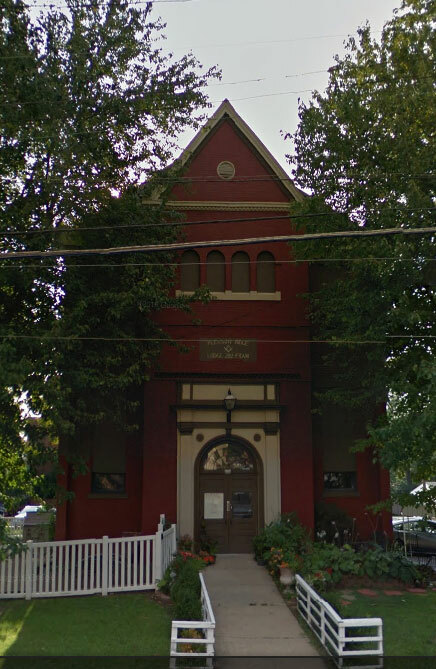 A petition was presented to the Grand Lodge in 1874 for permission to hold meetings alternately in Pleasant Ridge and Lockland, however this petition was denied and on Janyary 7,1887, the Lodge was moved into its present building. After thirty-six years, paying rent first to the Village of Pleasant Ridge and later to the City of Cincinnati, the Lodge purchased the present building, originally the Town Hall for the Village of Pleasant Ridge, from the City of Cincinnati. The Lodge was dedicated on March 10,1923 which indicates that even after the purchase of the building, the members did not consider this building as their permanent hall. War I prevented these plans from being completed and the lot was finally sold after our present building was acquired. A permanent building committee was appointed in October 1923, and later, on instructions from the Lodge, this committee presented a plan for remodeling the present building. This plan was adopted on June 2,1927 and a finance committee appointed to raise the necessary funds. Actual remodeling was begun on August 22,1933 and completed on December 23,1933 at an estimated cost of $12,500. The first regular meeting of Pleasant Ridge Lodge No. 282 F.&A.M. was held on November 18,1856. at that time Stated Meetings were held on Wednesday evening, on or before the full moon. This custom was continued until January, 1907, wen the Lodge adopted the first Friday of every month for their Stated Meetings. In the early days, at other than Stated Meetings, the Lodge was not closed but called for Labor to Refreshment to meet again at a stated time and place. Pleasant Ridge Lodge has always been charitably inclined and faithful to this duty. Frequent references are found to contributions by the Lodge to aid in the relief of such disasters as the Johnstown Flood, the California Earthquake, the Cincinnati Flood in 1883 and many others. During the depression years, the Lodge attempted to aid other Lodges and individual members who called on it for assistance. For many years, the Lodge has been a regular contributor to the Ohio Masonic Home and is today one of the leading Lodges in Ohio in its contribution. Mrs. August Laming, wife of August Laming,P.M. currently resides at the Ohio Masonic Home in Springfield, Ohio. In addition to the above Pleasant Ridge Lodge is currently contributing to: Masonic Employment Bureau - Ohio Special Olympics for the handicap - O.E.S. Hospital Circle - Masonic Relief Association - Masonic Home Sunshine Fund - and others. A relief fund is maintained to assist needy brethren and widows, and as of this writing approximately eight hundred dollars has been disbursed for the Lodge year of 1981. A gratifying custom which had its inception more than 50 years ago and has continued to the present time is that of visiting and presenting a gift to the widows of deceased brethren at Christmas. The affairs of the community have always been paramount to Pleasant Ridge Lodge and the lodge has participated in such public ceremonies as the corner stone laying of the Perry Monument in Sandusky, Ohio 1859; the Pleasant Ridge School building in 1909; the Silverton Presbyterian Church, the Masonic Temple in Milford, Ohio and the Cincinnati Masonic Temple all in 1926, Pleasant Ridge Presbyterian Church Educational Building in 1951, and the Corner Stone laying of Pleasant Ridge Lodge #282 on October 21,1956. Celebrating the Diamond Jubilee was a festive and gala affair for the Lodge in October 23,1931. After opening with a banquet at the Cincinnati Club, the members and visitors returned to the Lodge and proceeded to raise one candidate to the Sublime Degree of Master Mason. a total attendance of 333 enjoyed the work of the evening and the entertainment and refreshments which followed. The Centennial year was celebrated with a banquet at the Hotel Alms on September 29, 1056. Speaker for this important historical affair was the honorable James Garfield Stewart, Justice, Supreme Court of Ohio. October 31,1981 at the Quality Inn, Norwood Ohio. A banquet and entertainment added greatly to this historic event. The speaker for the evening was the honorable Raymond E. Shannon, Judge, on the County Court of Appeals. During each year several evening are set aside for special meetings. throughout the years these meetings have become associated with Pleasant Ridge Lodge and are eagerly anticipated by both members and visitors alike. Dating back to the early days of the Lodge, the observance of St. John's Day is one of the outstanding activities of the Lodge. At the invitation of one of the churches of the community, the Lodge attends the Sunday morning service as a group. Members and visiting brethren meet at the Lodge and march in a body to the church. This is one of the rare occasions when the Lodge holds a public display of the Masonic Lodge. "Past Masters Night", an annual affair of the Lodge, has become a traditional meeting. It is on this evening that Past Masters of our Lodge assume all of the stations and parts for the purpose of conferring the Master Mason Degree on the candidate for the evening. The newest Past Masters join some of the older Past Masters in showing us how the Degree should be performed and was performed, perhaps, in "The Good Old Days." Other functions of the Lodge celebrated annually are; A Family Picnic - St. Johns Day Breakfast - Officers Dinner - Distinguished Awards Night, where members are presented with 25, 50, and 60 year service award pins - a Children's Christmas Party with all bodies meeting in the temple participating - and the highlight of the year "The Annual Scotts Night". Scotts night had its inception in 1046 when a group of Scottish brethren from our Lodge decided to confer the Master Mason Degree with a full cast of Scotsmen complete with bagpipes, kilts, tartans, and plaids. This special meeting provides much of the color and pageantry of Old Scotland and has become a well known throughout the community. During the recent years the Pleasant Ridge Fellow Craft Club and Lodge have sponsored a softball team. In 1980 the team captured the division champions of the first Masonic District. a trophy proudly displayed in the trophy case in honor of its fine achievement. Another great achievement in 1980 was once again winning the Thomas Memorial Golf Trophy. this trophy was presented to Pleasant Ridge Lodge by Bro. Robert Schnell the team captain. This trophy along with many more are proudly displayed in our trophy case. 1963 - Under the direction of Edwin L.Teagle,Jr.P.M. the kitchen was renovated. 1966 - With Stewart E. Haines, P.M. directing, the old ceiling in the Lodge room was partially removed and a new acoustic ceiling installed. This not only added to the beauty of the room, it was an energy saver and greatly improved the sound. The painting and decorating was accomplished by the expertise of R. Donald Westerman, P.M.
1968 - A new organ was purchased. 1977 - Rewired and installed new wiring and switch boxes in the Lodge Room. 1978 - With the professional guidance of Edward P. Patton, P.M. the Fellowcraft room was renovated with installation of a new ceiling and paneling. This room serves as our banquet room for those occasions when we have a small attendance. Much of the cost of this improvement was paid for by donations from members of the various bodies meeting in the Temple by, either personal donations or donations in memory of a friend or loved ones. A plaque with their names inscribed now adorns a place in this room. 1979 - The upper banquet room was refinished. 1981 - In a further move to conserve energy, plexiglass was installed over the windows of the second floor. Although the cost of maintenance and improving our Lodge has steadily increased the past 25 years (1956-1981) Pleasant Ridge Lodge has been able to stay in the black financially. This has been accomplished by the contribution of many brethren and friends in time, money, and effort. I a further move to fight inflation we are now renting a portion of our parking area to the merchants of Pleasant Ridge and our banquet hall is being rented to Anneliese Von Oettigen School of Ballett. This additional revenue has helped considerably in our continued fight against inflation. In 1959 - the cost of insuring our building, and contents was $89.00 and in 1981 this cost is in excess of $1,100.00. PLEASANT RIDGE CHAPTER NO. 378 O.E.S. HENRY A. WEEKS COUNCIL NO. 137 R. & S.M. These organizations have contributed greatly to our success over the years. The continued success of our Lodge depends on each individual members contributions in time, money, effort, attendance, etc. and to that end we earnestly solicit your support. Thus was born and thus has prospered Pleasant Ridge Lodge No. 282, F.& a.M. and throughout its 125 years of life and development it has played and important part in the Religious, Moral, and Civic Life of its members and those with whom they came in contact. With God's favor, Pleasant Ridge Lodge will continue to grow and to prosper and look with confidence to the future. The preceding history is that of Pleasant Ridge Lodge #282 F.& A.M. from 1856-1981. The Lodge continued to fulfill its duties to its members, the fraternity and the community until August, 1995. In the years 1992,93,and 94 the Lodge continued to see a decline in attendance at meetings and was not receiving new candidates for initiation. Shortly after the Annual Stated Meeting of November 1994, Master, Ose Tomblin formed a committee with the intention of consolidating Pleasant Ridge Lodge with another Lodge. After several months of investigating three other Lodges it was decided to approach Montgomery Lodge #94, the Mother Lodge of Pleasant Ridge. At the June Stated Meeting the brethren present voted in favor of consolidation with Montgomery Lodge. The necessary petition was presented to Montgomery Lodge and in August 1995 the Grand Lodge of Ohio approved the consolidation. The brethren of Pleasant Ridge Lodge have been received warmly by the brethren of Montgomery. We have been active on several committees and the Temple Corporation of Montgomery Lodge. We see progress for the future and agree that this has been a good move.